Friends For Good is Australia’s first charity focusing solely on loneliness. This February we will be launching the first of many services for people who feel lonely or isolated. We are currently seeking volunteers for our friend line service. 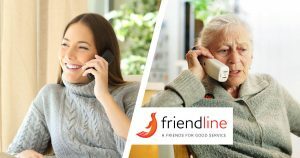 Operating from Melbourne’s CBD, Friend Line is a service for anyone in the general public who is feeling lonely or is trying to prevent loneliness impacting upon them. As a volunteer, it will be your role to have a friendly chat over the telephone with callers, talking about everyday topics. This service is not designed for crisis intervention or counselling. Volunteers will be required to undergo training and experienced volunteers will be trained to co-ordinate shifts and take over calls if required. Friendship line is operating in the preventative space of friendly calls only. At the end of each shift there will be an opportunity, led by co-ordinators, for volunteers to de-brief and talk about their experiences on the night. In addition to a listening ear you will be equipped with information about events that Friends for Good is organising so that invitations can be extended to callers. When would the service operate? The service will be open between 6-8pm Monday to Thursday, with have flexible shifts available in a professional, fun team environment. Still keen and want to get involved? All volunteers will need to fill out an application form, which includes a confidentiality and privacy agreement. After selection through an interview a Police Records Check will need to be completed and the results from this considered. There will be an initial training session and then on-going sessions provided. Get in touch with Friends for Good today for an application form and join us in our fight to end loneliness. Please quote in application: Friend Line Telephone volunteer via Pro Bono Australia.